Enjoy this tiny home on a big lot near Tofte Park Road. Have you ever wondered what it would be like to live in a Tiny Home? Hop on board with the Tiny House craze and book your stay at Superior Escape! This tiny home offers big adventure on Lake Superior's North Shore. Located a short walk from Tofte Park, a public boat launch, and beach area, this home sits on a 4-acre wooded parcel with no visible neighbors. You will feel like you are in the middle of nowhere without having to drive there. Superior Escape is a darling one bedroom, one bathroom tiny home built by Escape Traveler- an elite tiny home company that has been featured nationally on HGTV and other television shows. Superior Escape is the first Escape Traveler Tiny Home located in Minnesota and takes some inspiration from the designs of Frank Lloyd Wright! The home features a full kitchen with full sized appliances, a dining area with room to seat four guests, and a cozy living room with a gas fireplace and smart TV. Although it's a tiny home, the layout and use of space make the home feel spacious with room to unpack your belongings and enjoy your stay. An on-demand water heater ensures that you will never run out of hot water. Although not directly on the lake, you are close enough to hear the waves splashing against the shoreline. Open your windows in the summer and enjoy the sounds of the Lake. We recommend this home for a couple or a family. There is only one bed and the other two sleeping areas are futons in the living room area. There is limited privacy and space may be a bit tight for 4 adults. This home also has some ADA compliant features including an exterior ramp and shower with a seat that would make it a nice property for someone with a walker/cane or other mobility issues. The town of Tofte is a great home base for many North Shore adventures. In the summer months, you are just a short drive away from miles of hiking and biking trails, including the Gitchi Gami bike trail and Temperance River State Park. In addition, you are just 10 minutes from the Superior National at Lutsen Golf Course. Head inland to the Carlton Peak area in the fall to take in the beauty of leaf change season on the North Shore. 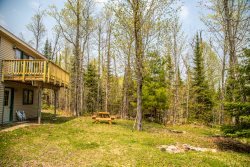 In the winter months, you are just a 10-mile drive from the Lutsen Mountains Ski Area (also a great summer destination with an alpine slide and sightseeing gondola) and have easy access to miles of snowmobile trails (plus plenty of room for a trailer). In the spring, a short drive to any of the area state parks will bring you to amazing waterfalls that truly come to life during the "waterfall season" every spring. Looking for more adventures? Visit Sawtooth Outfitters for ideas of where to go, what to do, and to rent the gear you need to do it- you're within easy walking distance! If you are craving a bite to eat take a short stroll to the Bluefin Grill or CoHo Cafe. Many other dining options are just a short drive up the shore in Lutsen. Take a day trip up to Grand Marais, 30 miles up the shore, for a day of shopping and dining at this quaint lakeside town. You can also just stay home and enjoy the 4-acre property and close proximity to Tofte Park. The home is bright and welcoming, you may not want to leave once you arrive! We only contacted the office once with an issue on the door but they were very helpful and polite. Outstanding assistance. Couldn't have asked for anything more from them. OUTSTANDING - This place was amazing, loved the "Tiny House" experience. This is called a tiny house but with the large windows is was anything but tiny. The setting and house was beautiful and very well equipped for our needs. Would HIGHLY recommend this to everyone - location was excellent to the Lake, hiking and exploring. Everything about this Tiny House was AMAZING. So glad we stayed. Will return! Great! We couldnt open the lock with the code so we called and they helped us right away. The house is perfect! Beautiful and cozy! Well be back!